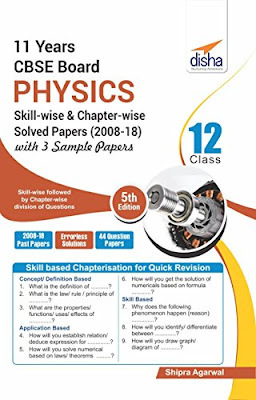 CBSE Class 12 Physics Solved Papers (2008 - 17) in Level of Difficulty Chapters with 3 Sample Papers 4th Edition is altogether a new approach for Practicing, Revising and Mastering Chemistry for Class 12 CBSE Board exams. The book covers solutions to the Physics questions that appeared in the 2008 - 2017 Question papers of CBSE Board Delhi/ All India/ Foreign papers. The book provides a unique and innovative chapterisation defined on the basis of Level of Difficulty. Some of the typical chapter names are: What is the definition of? How will you identify/ differentiate between? Why does the following phenomenon happen (reason)? How will you draw graph / diagram of? What is the law/rule/principle of? What are the properties/ functions/uses/effects of? How will you establish relation/deduce expression for? How will you get the solution of numerical based on formula/ laws / theorems? etc. The book also provides 3 Sample papers with detailed solutions. The papers have been designed on the latest pattern of the exam as announced by the CBSE.